Our Rock Hill superstore is NOW OPEN in historic downtown Rock Hill, SC! Come visit us at 139 Caldwell St and check out all of our vintage systems and games for sale, as well as our selection of classic arcade games for sale just in time for Christmas. Whether you want to buy a $1 NES game or a $1000 arcade game, we've got something fun for every budget. Feel free to just stop by too, and browse. 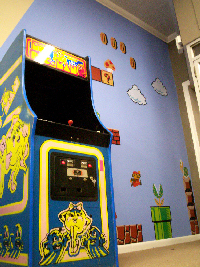 We sell videogames, accessories, and parts for classic home entertainment systems, as well as Arcade Games. We specialize in older, less expensive videogame systems from when games were less about cash and more about fun. If you're looking for a game you played as a kid, or a cable to get that old Nintendo working in your garage... give us a call! If there's something you're looking for please give us a call, we may have it! We can be contacted 24 hours a day, by phone, or by email. This website designed by Free CSS Templates.